Castor oil boasts numerous medicinal benefits. One of its most potent ingredients, ricinoleic acid, is responsible for castor oil’s laxative and labor-inducing properties. The oil also contains fatty acids that help nourish your hair and skin. Yet, in spite of the many benefits of castor oil for the body, it can still have a number of side effects in some individuals. Castor oil side effects range from mild digestive symptoms, like nausea and vomiting, to serious allergic reactions, such as difficulty breathing. Read on to learn more about the safety of castor oil, as well as potential castor oil side effects. Castor oil has long been used as a remedy for constipation. Although it can have side effects, it is deemed safe for consumption in limited amounts and prescribed dosages. According to the United States Food and Drug Administration and International Castor Oil Association, castor oil is safe even at dietary concentrations as high as 10 percent for 90 days. This dosage has not been proven to produce any harmful castor oil side effects. However, castor oil also contains a substance known as ricin, which is a potent protein toxin. If ingested orally, nasally, or intravenously, ricin can get into the cell’s ribosomes and prevent protein synthesis, which can kill the cell. Ricin is made from the “mash” or residue left over after processing castor seeds into castor oil. The bad news is that as little as one milligram of ricin can be fatal if ingested, inhaled, or injected. That means eating just 5-10 castor seeds can kill you. There is also no antidote to ricin, which is the reason it has been used as a warfare agent. Fortunately, as the International Journal of Toxicology explains, ricin does not partition into the castor oil, so there is no need to worry about being poisoned by it. In fact, castor oil has been both ingested and used as an ingredient in cosmetic products for many years, and no untoward incidents have been reported. The Joint Food and Agriculture Organization and the World Health Organization Expert Committee on Food Additives claim that a maximum of 0.7 mg/kg body weight of castor oil daily is safe for human consumption. There is no need to worry about ingesting or using castor oil, as long as you take the prescribed dosage and do not go overboard. One of the most common castor oil side effects is digestive disturbance. Although this is mostly minor, some castor oil users report experiencing castor oil side effects such as nausea, vomiting, diarrhea, stomach discomfort and faintness. The longer you use castor oil, the more likely you are to experience castor oil side effects. Aside from digestive problems, you might also experience side effects if you happen to be allergic to certain castor oil ingredients. These can occur not just when you ingest castor oil, but even when you apply it topically to the skin or hair. Mild allergic side effects include itching, rashes, redness and a stinging sensation. Severe castor oil side effects include swelling of the face and throat, dizziness and difficulty of breathing. To find out whether you’re at risk of any of the aforementioned castor oil side effects, conduct a patch test. Put a small amount of castor oil on your forearm and wait for 24 hours. If there is any type of reaction, even slight itching or redness, you should not use castor oil because you are at risk of experiencing allergic side effects. If you take castor oil every day for a week, you may also be at risk for potassium and fluid loss. Dehydration is one of the less common, yet more dangerous castor oil side effects. A daily dose of 15-60 ml may prevent the digestion of some valuable nutrients, hence leading to dehydration. To avoid this, make sure that you follow the instructions given by your physician. 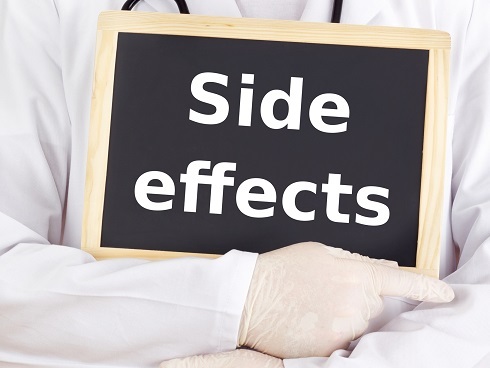 To avoid castor oil side effects, it is important to err on the side of caution. Tell your doctor if you have any allergies, as castor oil might contain inactive ingredients that can also cause you to experience allergic reactions. You should tell your doctor if you experience any symptoms of appendicitis, like unexplained abdominal pain and nausea and vomiting, as well as sudden changes in bowel habits that last longer than two weeks, or rectal bleeding. These might be indicative already of severe castor oil side effects. Since castor oil is also known as a potent labor inducer for pregnant women, taking castor oil during pregnancy is not recommended, especially without the supervision of a doctor. It is very dangerous for pregnant women to take castor oil, especially if they have not reached full-term, as it may induce premature labor. Likewise, consult your doctor first if you want to use castor oil during breastfeeding, as it is unknown whether castor oil enters breast milk and passes on to the baby. Being aware of the various castor oil side effects is of utmost importance before deciding to use castor oil yourself. If you experience any of the severe side effects discussed, call your doctor immediately.